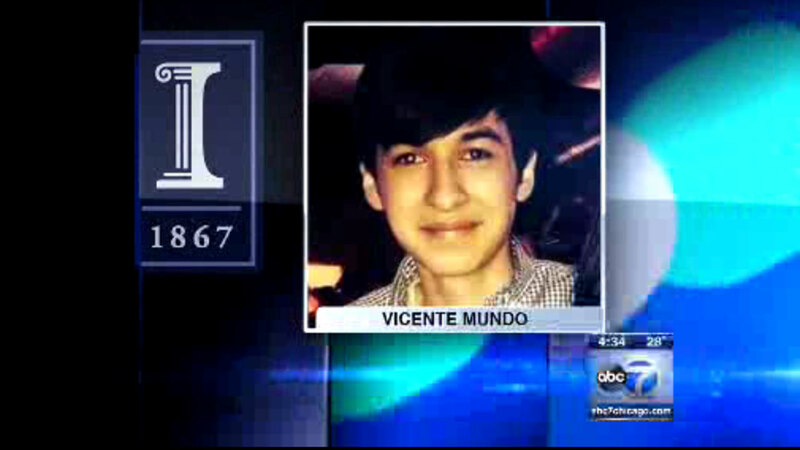 CHICAGO (WLS) -- Friends and loved ones will gather Saturday morning to celebrate the life of University of Illinois student Vicente Mundo, who was shot and killed in a robbery. The memorial service will be held at 10 a.m. Saturday at Curie High School in Chicago, where he was a student. Organizers are asking attendees to wear one white or light-colored piece of clothing. "He was really smart," said friend Stanley Canty. "If people have problems in class he would go an help them, you know. It wasn't nothing for him to help people so he was really smart, really funny too. You know it's pretty sad that we lost him." Mundo's body was found last weekend, after he disappeared from a friend's home. Daniel Gonzalez and Reginald Scott are charged with his murder.